Up until the arrival of the fitted sheet the only option was a flat sheet and carefully constructed hospital corners but these rarely stayed in place. It wasn’t unit 1959 that Bertha Berman patented the idea which was then improved on in 1990 by Gisele Jubinville who later sold the patent for $1million. Since then the principle hasn’t really changed, it’s a sheet with corners and elastic to hold it on. It sounds simple enough but how many of us have felt our stress levels rising whilst attempting to get the short side of the fitted sheet to fit over the long side of the bed? Add to this the irregular shaped beds on most yachts and you find yourself only moments away from flinging the fitted sheet out the window. So why is such a simple idea causing so many headaches? It’s all in the measurements – if the sheet isn’t made to fit correctly it is never going to fit. 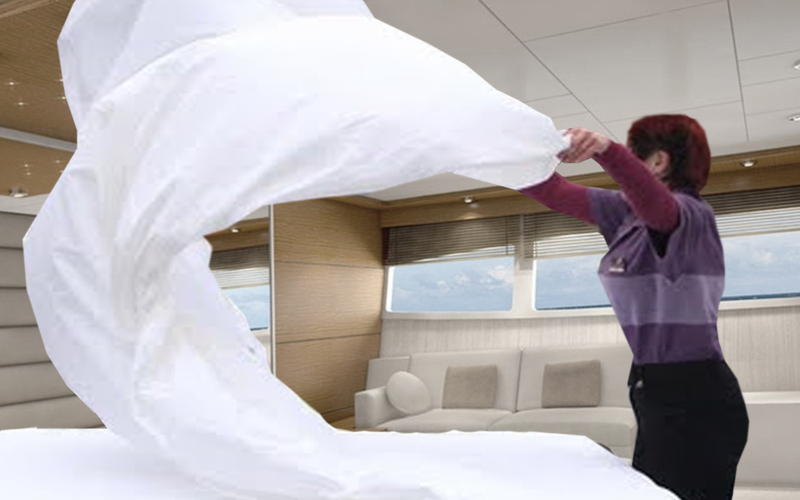 Fear not fitted sheet phobes – Home & Yacht Linens and Interiors can help smooth away those shattered nerves. We provide bespoke and standard bed linens and are experts with fitted sheets for the all types of irregular shaped yacht beds. To get a fitted sheet that fits perfectly requires that the bed is measured correctly and knowing which parts to measure. (Home & Yacht typically take at least 10-15 individual measurements of a typical bed) Secondly the elastic has to be perfectly tensioned to give just the right amount of resistance to keep the sheet on without the need for super human strength to stretch it onto the bed. And finally, a label for each sheet with the name of the boat and the cabin/bed it goes on helps to make up a bed on the move by placing the label in the centre of the head of the bed and working around the sheet until you find yourself back at the top with a perfectly fitted, beautifully smooth fitted sheet. At Home & Yacht Linens and Interiors we offer a wide range of standard and bespoke bedding. Our own range of 400 thread count Egyptian cotton and our luxury Italian woven fabric is in stock with fabric available to bespoke make any irregular sized items.